Very pretty big girl who looks as if she could be a hand full! I don't know how many realize that Constellation is a half to You Tube star Back Flip. Following a “TDN Rising Star” worthy debut with a third in the 2016 GI Spinaway S., Constellation captured both the 2015 Furlough S. and 2016 Ruthless S. at Aqueduct before finishing fourth in that venue’s Cicada S. last March for former trainer Steve Asmussen. Given some time off, the $800,000 OBSMAR buy resurfaced under Hollendorfer’s care in Turf Paradise’s City of Phoenix S. Nov. 12 and sprung a 12-1 upset in Arcadia’s GI La Brea S. last time Dec. 26 (video). Champagne Room will be in a unique position Feb. 5 at Santa Anita Park, where she'll make her 3-year-old debut in the $200,000 Las Virgenes Stakes (G2). The champion 2-year-old filly of 2016 and the 14 Hands Winery Breeders' Cup Juvenile Fillies (G1) winner likely won't be favored. The horse of the moment, Unique Bella, off back-to-back freakish performances, should assume that mantle. Five horses entered in the Las Virgenes - pitiful! Mistressofthenight has been scratched from the Las Virgenes. No show wagering now on the four-filly field. 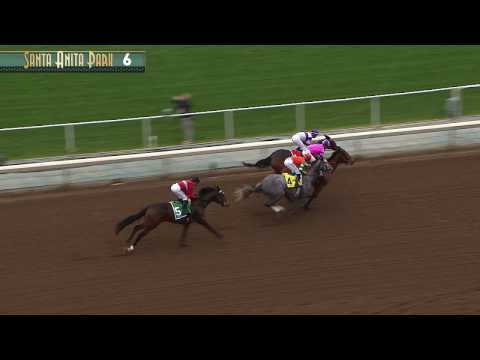 I have posted a reply of her race in the 2017 Kentucky Oaks discussion if anyone wants to see it. Las Virgenes Stakes (Gr. II), won by Unique Bella. February 5, 2017. To coin a phrase, "Here's a future superstar." Hope she goes to the Derby. If there ever was a filly to put in Derby preps, this is the one. She's got the size, speed, talent, and heart. She reminds me so much of her close relative, Arrogate. Some have drawn comparisons between Unique Bella and Winning Colors. Winning Colors, in a terrific wire-to-wire performance over the boys.